Psoriatic arthropathy is a chronic inflammatory rheumatic disease that may affect patients with the dermal disease psoriasis. The joints of the extremities are most often involved, but approximately one third of the patients have inflammatory changes of the spine and/or the sacroiliac joints. Predominant osseous inflammation localised to the cartilaginous portion of the joint. A mixture of joint space and osseous inflammation, often located to the distal part of the joint. In later stages there may be chronic changes in the form of erosion and unilateral or bilateral joint space alteration. Semi-axial T1 FS after intravenous Gd. contrast shows subchondral enhancement of the bone corresponding to the cartilaginous portion of both joints (arrows). Semi-coronal and semi-axial T1 FS after intravenous Gd. contrast showing enhancement in the joint space (black arrow) as well as in the adjacent bone (white arrow). 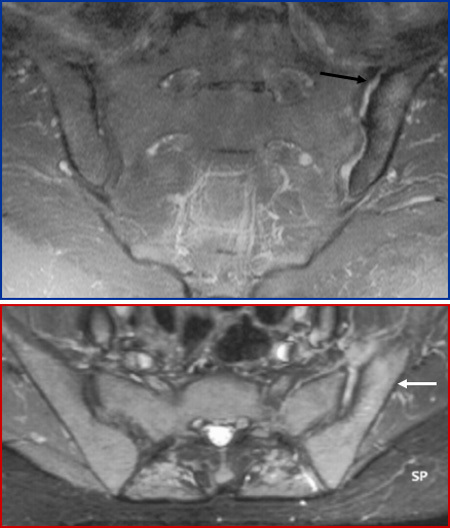 Semi-coronal T1 FS image clearly shows erosion corresponding to the right sacroiliac joint (arrow). 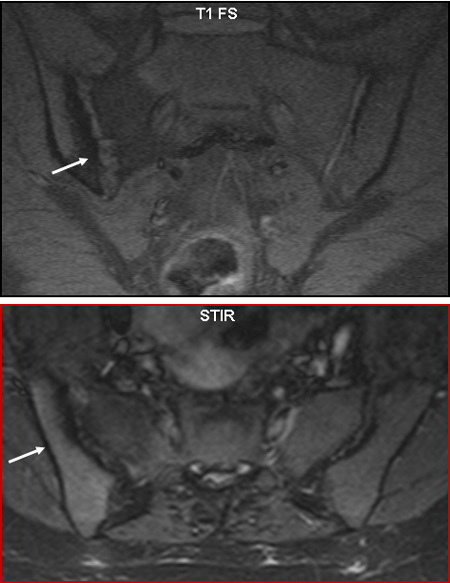 The semi-axial STIR image demonstrates accompanying inflammation in the surrounding bone (arrow). 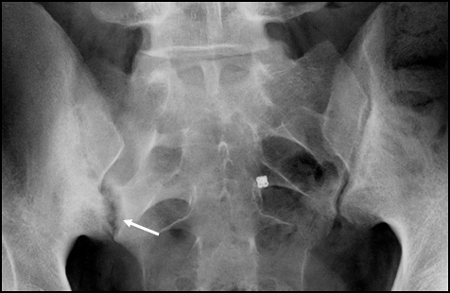 Simultaneous radiography shows definite chronic changes in the form of erosion and joint space widening (arrow) with some subchondral sclerosis in the iliac bone. 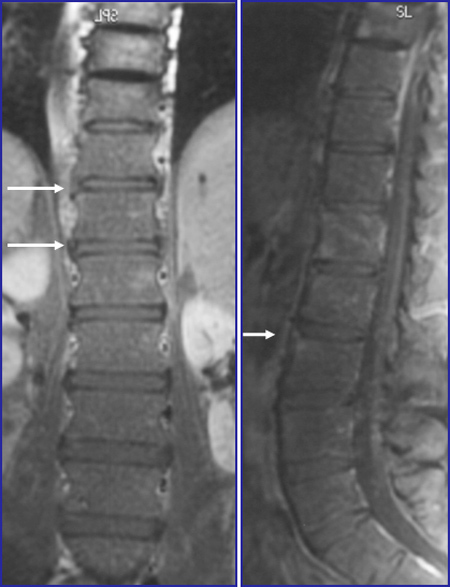 Active spinal changes may, like abnormalities of the sacroiliac joint, have two different appearances. There can be mainly osseous changes localised adjacent to the vertebral plates or anterior in the vertebral body beneath the attachment of the longitudinal ligament. Bone marrow oedema at the corner of vertebral bodies and signs of new bone formation around the discs can also occur and may be indistinguishable from changes occurring as part of reactive arthritis. 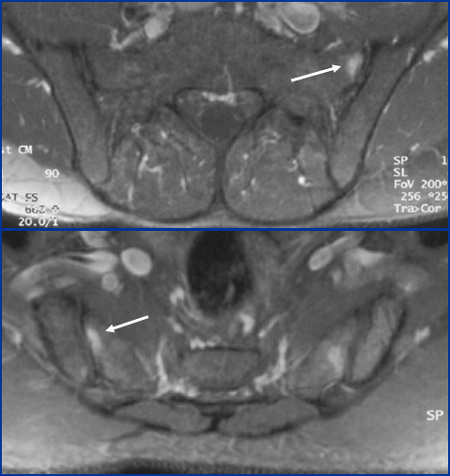 Left image - Sagittal STIR showing osseous oedema adjacent to the vertebral plates of L2 and anteriorly in vertebral bodies beneath the attachment of the longitudinal ligament (arrows). Right image, one year later - Sagittal T1 FS + Gd. showing increased inflammation superiorly in L2, but regression in the other regions. Coronal and sagittal T1 FS image after intravenous Gd. 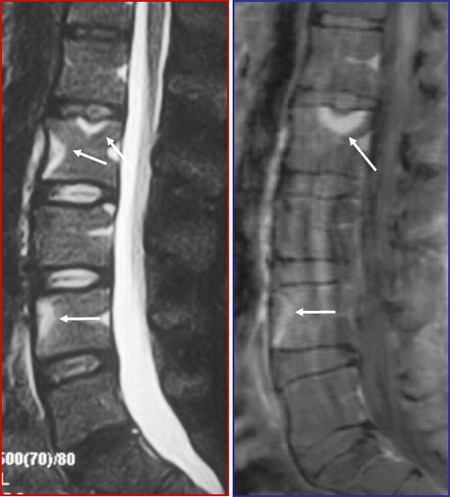 showing enhancement at the corner of vertebral bodies and signs of new bone formation around the discs (white arrows).